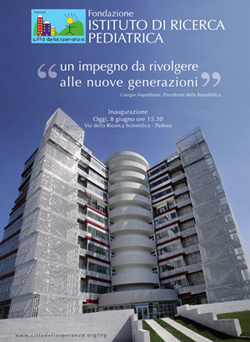 On June 8th, in Padua, there has been the opening of the new “Città della Speranza” Pediatric Research Institute, at the presence of Luca Zaia, President of the Veneto Region, Flavio Zanonato, Mayor of Padua, Giuseppe Zaccaria, Rector of the University of Padua and Antonio Mattiazzo, Bishop of Padua. This work is considered the biggest European scientific research area on infant diseases. The institute, which is built on an overall surface of 17.500 square meters, for a total real estate value of 45 millions of euro, will provide space for more than 350 research workers. The building, executed in just 3 years, is inspired to the image of an angel with half-closed wings and a DNA molecule to convey the double message of trust in science and human solidarity towards those who are suffering. S.T.E. Energy, EPC Contractor belonging to the Sorgent.e Group, worked on the execution of the HVAC systems of the tower, both for the part devoted to offices and to the one devoted to laboratories, essentially including the air-conditioning system, the sanitary water distribution, the air treatment system with variable load output, the fire-prevention system, the osmotic water production system for research laboratories and the external irrigation. The prearrangement for the district heating/cooling system has also been executed and will be completed within a short period of time.